I woke up at three in the morning and couldn�t go back to sleep, and I didn�t really want to. It was lovely to lie there watching the stars and listening to the night noises of Africa. Some were gentle and some sounded fierce, and many of the animals� voices did not sound like you would expect them to. Tolkien�s line �Heed no nightly noises� came to mind. The lions came again, at first distant, but moving ever closer. Soon their roars, moans and grunts were really loud; they were just outside the camp again. We could hear the faint answers of others in the distance. West had told us that if lions are roaring, they are not hunting � they are quiet when they stalk prey. 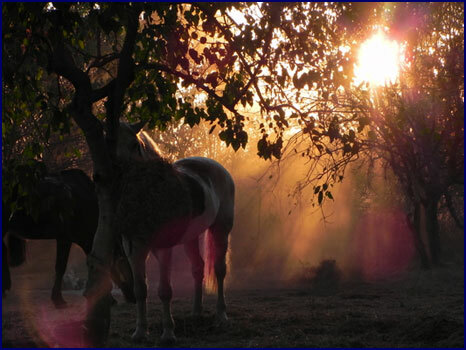 Good news for the horses � and for the guides as well, in their beds among the trees outside of the kgotla. I lay in my bed looking up. The stars were like jewels amid the leaves and branches of the tree. I could see Orion, hanging low in the eastern sky, upside down. Venus was radiant as dawn slowly crept into the sky. The pearl-spotted owl whistled, and a chorus of jackals raised their voices to greet the morning. We rode out just after sunrise, enjoying the quiet of the early morning. I rode Lancelot in front with West, and Jineen, on Roscoe, stayed in the back with Mooshi. We found an elephant skull in the woods, and West showed us that it was honeycombed, with hollow chambers. Leaving the trees, we rode back across the dry barren plain past Mapungubwe Hill. We paralleled the road for a while, past the remains of some old huts and bomas, and then crossed back through the foot-and-mouth disease veterinary station. 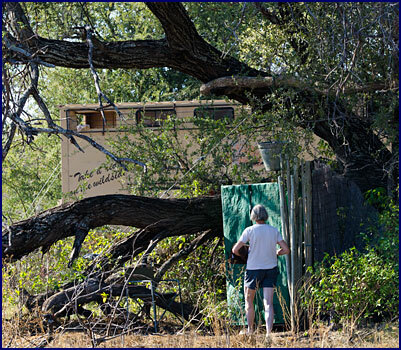 We saw the Limpopo Valley Horse Safaris truck go by on the road, transporting our tents and equipment to the next camp. We crossed a vast bare area with little vegetation and few animals. Again, there were lion tracks in the dust. 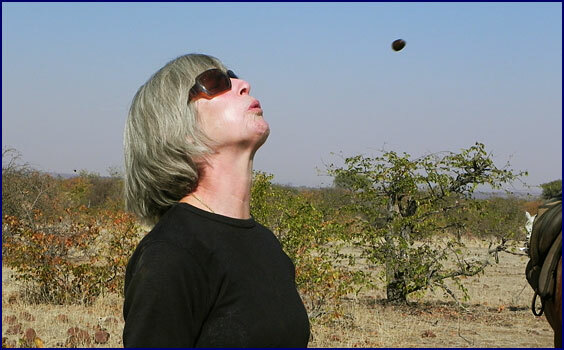 When we stopped for the morning break, Saskia introduced us to a unique African sport: Impala dung spitting! You take an impala pellet, put it in your mouth, and see who can spit it the furthest. It�s not really as gross as it sounds � the impala dung consists of hard dry little pellets with no taste or smell. We all gave it a try, but Jineen proved to have a real talent for it, surpassing everyone in range if not accuracy. Trying to photograph her in action, the impala dung proved too small to show up in the pictures � so she progressed to eland turds, which were larger and somewhat less pleasant. We found a scorpion shell on the ground and were fascinated by it, so Mooshi turned over rocks until he found us an actual live scorpion - our new species for the day. Saskia pointed out that scorpions are the main reason why it is so important to inspect your shoes before you put them on in the mornings. Ugh! I had not been checking my shoes, but from then on I made sure to! When we rode on, we encountered a scattered herd of giraffes. Several of them watched us curiously, allowing us to get quite close before moving away with their deceivingly slow strides. Zebras with half-grown babies were grazing with a small herd of wildebeests, but both were skittish, and took off when we approached. A Bataleur eagle sat in a tree, and a korhaan flew just above the bushes. We heard the eerie high-pitched cry of a fish eagle, flying high above us. 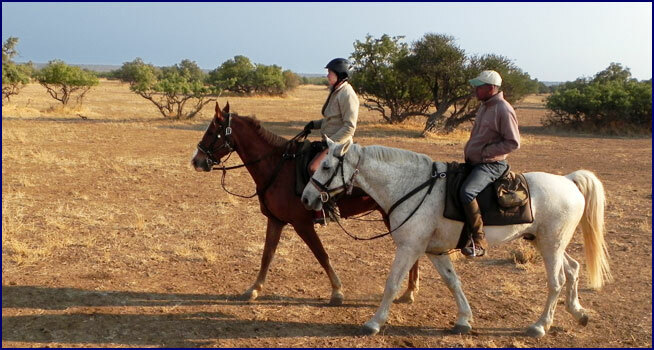 It was an incredible experience, riding horses through the bushveld. It felt like Wild Africa as it was meant to be. Instead of watching nature, we were experiencing it. We were no longer just looking at the circle of life � we were a part of it. We stopped at a watering hole to give the horses a drink, and Jineen�s mount Roscoe tried to lie down and roll; he squealed and bucked when she wouldn�t let him. Saskia laughed and said that was why they called him Rascal. Jineen was appalled to realize she had been calling the horse the wrong name all week, having misunderstood when she was introduced to him � Roscoe was really Rascal! We had several good long canters, and I decided it was time to try some galloping photography. If Pauline could do it, then so could I! It turned out to be trickier than it looked, necessitating swerving out of line and controlling the horse at the gallop over rough terrain with one hand, while holding the camera and taking photographs with the other. The camera was bouncing wildly, and I had several close encounters with thorn bushes. I ended up with photos of the sky, photos of the ground, of Lancelot�s mane, and close-ups of my zebra-print gloves. And yes, I did get a few of the horses and riders galloping as well. We rode into Liana camp, named for the liana vines hanging everywhere � they looked like something Tarzan would swing from. The lunch table, as usual, was set up under a huge mashatu tree. 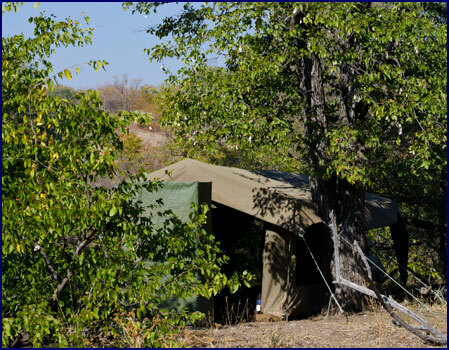 Our tents were in a large gully, with an elaborate network of liana vines draped above them. The horses were untacked and allowed to roll in the sand, and the saddles were lined up on a log beside a large hay roll. We took turns using the bucket shower up on the hill. Behind the tent, we noticed with amusement, our toilet was securely tied to a tree; I guess they didn�t want to risk another accident in the night. 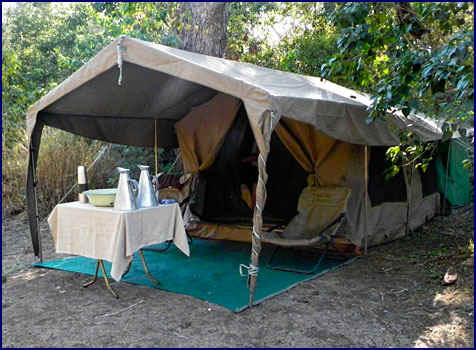 West told us that the camp was close to the Limpopo River, but we were not allowed to go walking on our own, so we never saw it. We would have liked to slip off and go exploring, but we didn�t dare. But after lunch Pauline came running breathless to our tent, with news that there were elephants just above the camp. The three of us snuck up the hill and watched them through the trees, the closest we had been to elephants on foot. We decided not to mention it to the guides. The Limpopo Valley Horse Safaris had arranged for us to go on a proper game drive in the afternoon. At 3:30 a guide named Isaac showed up from the Mashatu Main Lodge, driving a Landcruiser. We all piled in with enthusiasm. Although Jineen and I had been for a week of game drives prior to the horse safari, the others had not had that experience. We were hoping to find big cats. Almost immediately we came across several waterbucks; these large deer-like antelope have soft fluffy brown coats and a white circle like a target on their rump. Five minutes into the drive and already we had seen something new! A large herd of elephants walked across the plain towards us. Isaac stopped the �cruiser in their path and waited for them to pass. It was a family group, consisting of mothers with babies, sisters and aunts. They strode past us in single file. 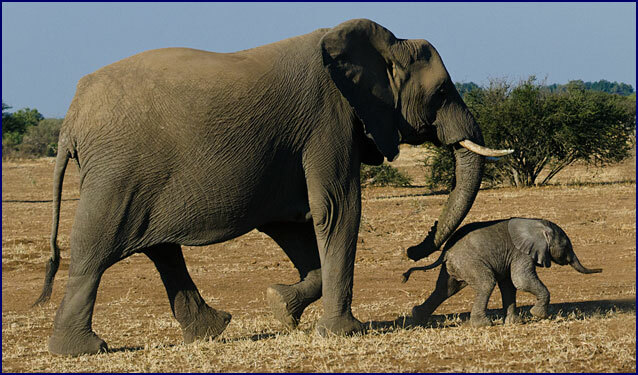 One huge matriarch came by with a tiny baby � he was by far the smallest we had seen. He still had the long fringe of fur that the babies are born with, and the adults were helping him along, supporting him with their trunks as he tottered on wobbly legs. Isaac said he couldn�t have been more than two or three days old. We were surprised to get such a good look at one so young, as normally the adult elephants surround a new baby to protect it from sight. We felt extremely privileged. This was Pauline�s first chance to get so close to elephants. �Whhaaaa!� was her response. As the light was starting to dim, we drove near the river among the trees. 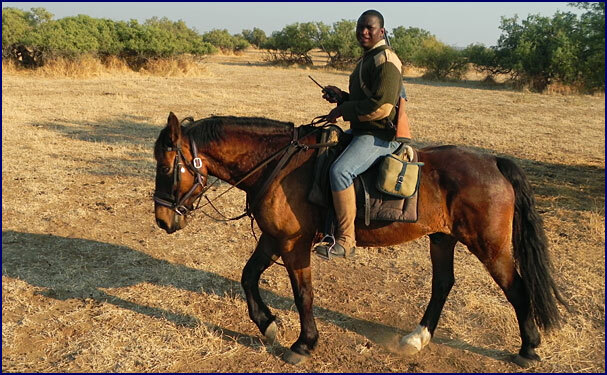 On horseback you can�t get close to the big cats like you can in a vehicle, so we were searching for leopards. We scanned the trees for leopards sleeping on a branch, but we had no luck. It was a beautiful evening; the low sun cast long shadows, and the shafts of light hitting the white bark of the shepherd trees made them stand out brilliantly. Mooshi described the differences between the shepherd tree and the stinky shepherd tree, but the distinction eluded me. A bush pig rooted through the underbrush near the river, his silver mane contrasting with his chestnut coat; they are very shy, and he took off as soon as he glimpsed us. A large group of mongoose passed in front of us, moving in unison � they stopped to investigate, standing up on their hind legs and peering at us curiously. We stopped for Sundowners on a small knoll, where we watched the sky turn to red through the trees. On the way home in the dark, Isaac drove while West and Mooshi wielded the spotlights. There was plenty to see in the night. We got a glimpse of an African wild cat, somewhat similar to a house cat but larger. The spotlight shone on two genets hunting for small things in the grass, and a third one nearby. A spotted eagle owl was on the ground, eating something it had caught. Several ostriches were lying down right beside the road; they looked at us with absurd expressions of alarm. We saw two kori bustards, one walking and one in flight. We passed elephants and giraffes, moving dreamlike through the dark. Suddenly there was a rustling noise, and the guides shone the spotlight on a flurry of motion as a porcupine shuffled rapidly away from us. �Whhaaa! Porkypig, porkypig!� Pauline exclaimed with delight, using the French name for porcupines. We had seen their tracks and found a few quills, but we had not expected to get to see one of these shy nocturnal creatures. Isaac tried to follow him with the �cruiser, but he was long gone. 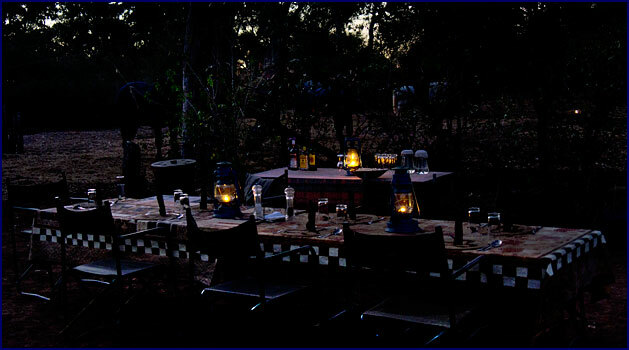 We had dinner by candlelight under the Mashatu tree. We caught a glimpse of an African wild cat in the cooking area as it came to scavenge for scraps. The owls were calling, and the stars were dazzling overhead in a sky of black velvet. As the temperature dropped we moved closer to the fire. We heard the call of hyenas, close and loud. West told us about witch doctors. Involvement with these shamans is a real way of life in the villages of Botswana, akin to a religion. Mooshi related some stories as well. You can hire a witch doctor to heal your ailments or to put a curse on your enemies. They get assistance from their ancestral spirits, and use the �throwing of bones� to read the future. Ignore their advice at your own peril. In that place and time, I could totally believe in the power of witch doctors. There was a film crew in camp in the morning, making a segment for a TV show about horse trekking � so we got to sleep in until 6:20 and have a leisurely breakfast. Saskia had gone to assist the film crew, so our riding group was down to seven. The staff broke camp and packed everything into the truck, and we rode out at 7:30. A red-billed wood hoopoe was pecking for insects in a big candelabra tree; this medium-sized bird was black with white bars on its wings, long tail feathers, and a distinctive red curved beak. A new species for the day already! West told us that the candelabra tree contains a hallucinogen, which the witch doctors use to see the future. Also, if you get it in your eyes it will blind you. Nice. 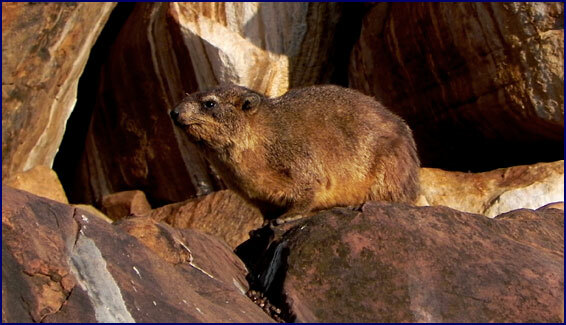 We watched the rock dassies, also known as hyraxes, scurrying along the cliffs nearby. West claimed they are the closest living relative to the elephant. He said you can see the similarities: like the elephant, the hyraxes nurse their young between their front legs, and both have the same number of bones in their feet. Oh, yeah, we teased him, elephants and hyraxes are very much alike � except for the size, the color, the ears, the trunk . . .
We passed termite hills higher than our heads. West pointed out a dung beetle ball on the ground, which looked like the hollow remains of a tennis ball. The dung beetle rolls manure into a ball, and then incubates its eggs in it. We rode down along the Limpopo River. It was green and shady compared to the dry bush we had been traversing, almost a different world. We watched as three elands waded across the river, coming over from the South African side. West pointed out a tiny pearl-spotted owl high up in a tree. I don�t know how he saw it; it took me ten minutes to find it even with him pointing it out. We watched a woolly-necked stork fly down the river and land, while a pair of Egyptian geese floated nearby. Leaving the river, we rode up a tributary creek. A colony of white fronted bee-eaters had made their home along the high clay bank; these brilliant green birds, accented with red and yellow, flew back and forth over the water hunting for insects. We almost saw a honey badger � West thought he got a glimpse of one in the thickets. These weasel-like relatives of the badger are absolutely fearless and very aggressive, one of the few creatures that none of the other animals will mess with. We searched for it in the underbrush, but to no avail. I was riding up front with West, and he told me how he got the scar on his arm. He had been riding as backup guide when a leopard attacked from a tree. He was fending it off by cracking the bullwhip, and with a snarl it turned to run � but as it leapt past him one of its claws caught West on the forearm, making a nasty gouge. It was an impressive story, and I might almost have believed it, except that when I had asked him earlier in the week about scary guiding experiences he had denied having any. He admitted that he was making the whole story up; we decided to try it out on Jineen later. We stopped for a break under another great mashatu tree. Mooshi found a spray beetle rummaging around in the short grass; we felt this was close enough to a rhino beetle to complete our Little Five. West told Jineen the story about the leopard giving him the scar on his arm, and she was extremely impressed. 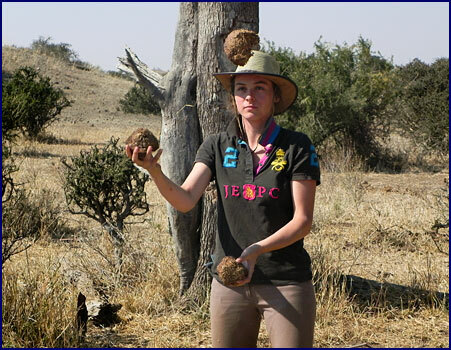 Multi-talented, Pauline demonstrated her dexterity with an exhibition of elephant dung juggling. West told us that a group of zebras is called a Dazzle, which got us on the subject of collective plurals for the animals. He told us others; some of them made sense, but some seemed more like nonsense. We could see the logic in a Clan of Hyenas, a Troop of Monkeys, or a Float of Crocodiles. One could imagine the origins of a Parliament of Owls, a Cackle of Jackals, and a Prickle of Porcupines. Others were more fanciful, such as a Leap of Leopards, a Journey of Giraffes, a Memory of Elephants, or an Elegant of Cheetahs. But I�m not sure where a Sounder of Warthogs or a Business of Mongoose comes from. The one that made perfect sense, however, was a Congress of Baboons . . . Riding on, we passed a dozen zebras, standing silhouetted on the top of a hill with some wildebeests. West asked us if we knew how to tell the males and females apart (aside from the obvious equipment). We didn�t know the answer, so he grinned triumphantly and told us that the males are black with white, but the females are white with black. Or was it the other way around? We were riding through a fairly remote area of Charter Reserve, where few people visited. We crossed a river and suddenly West brought us to an abrupt halt. There ahead of us, less than a hundred yards away, was a pride of seven lions! They were sitting in a group, staring at us intently. There were two adult lionesses and five half grown youngsters � West said it was probably the same group we had seen on the game drive from the Mashatu Tented Camp. There are not a huge number of big cats in the Northern Tuli Game Reserve, so the guides get to know each individual. The guides try to avoid lions and leopards when on horseback; they carry radios, and check in with the drivers from the tented camp to see where these cats have been sighted so they can steer clear of those areas. But these lions had not been located recently, and so we happened upon them quite unexpectedly. They stared at us raptly, probably trying to decide whether we represented a threat or a meal. We watched them for a minute before West hurried us off; clearly he felt it was inadvisable to linger. The lions watched us intently as we rode out of sight. West said it is rare to encounter lions on the horse safaris; this was just the second time he�d seen them all year. Saskia had advised us earlier that if a lion were to attack while we were riding, we should jump off and let the lion have the horse. We hoped not to test the theory. Leaving the lions behind, we crossed a plain with the most abundant populations of animals we had seen yet. No wonder the lions like this area! The animals were all on the move � we called it the Great Migration. The largest herd of zebras we had seen yet were running with the wildebeests. Giraffes moved across the plain with majestic grace, like creatures from a dream. Herds of impala darted across in front of us, leaping and kicking as they ran. 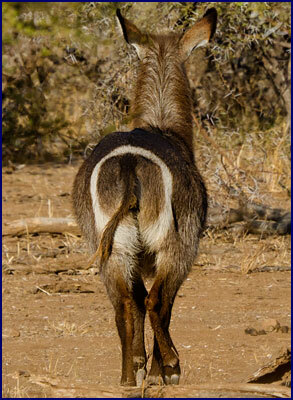 Elands and kudus moved across the plain together, and warthogs ran with their tails held straight up in the air. I have always been drawn to the wild places, and this was about as wild as it gets. Riding through Africa was an amazing journey. Looking at the view of the world from between a horse�s ears, I felt like I belonged there. The circle of life had never felt so close. In the early afternoon we arrived at the Zeederberg Camp. It was named after the Zeederberg brothers, who ran a stagecoach line in the area back in the 1800s. It was a lovely open camp, set in a wide clearing beside a small (dry at the moment) river. 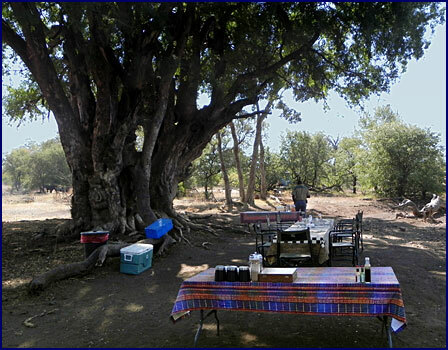 The dining table was under a huge Mashatu tree (what a surprise), and the tents were set up along the creekbed. A lovely stiff breeze was blowing as we explored the camp. 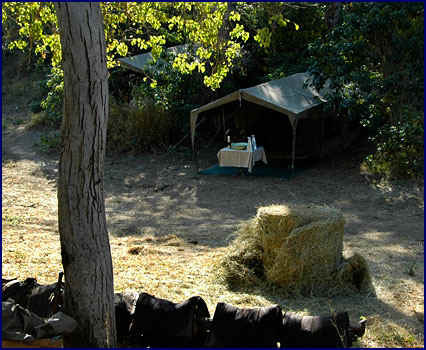 It was a beautiful setting, my favorite of the temporary camps. And when we packed up and moved on the next day, there would be nothing left but nature. We used the bucket shower, and then relaxed around the dining table. 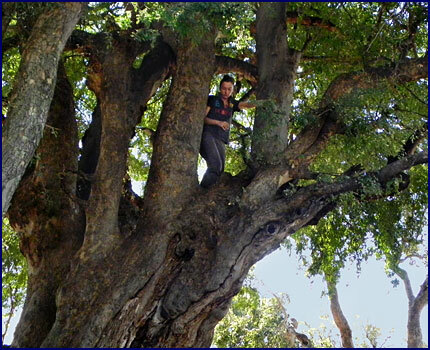 Pauline climbed high in the Mashatu tree. It was an utterly peaceful afternoon. For our evening outing, we walked to Zimbabwe. West took us up a small dirt road behind camp, where everything to the left of the road is in Botswana, and on the right is Zimbabwe. 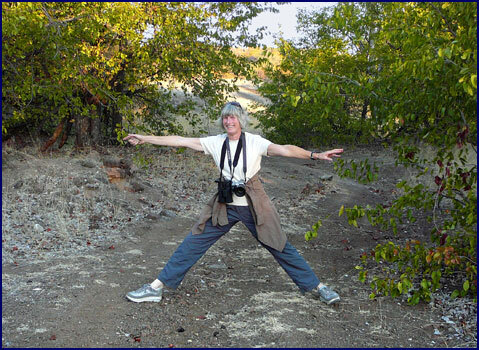 Jineen stood with her legs stretched out practically doing the splits, one foot in each country. The Shashe River is the border between the two countries, but there is a semi-circle of land on the Botswana side of the river that belongs to Zimbabwe. West told us the story of how that came to be: A powerful man in Zimbabwe had built a fortress on a hill beside the Shashe River, and had claimed all of the lands within range of his cannon. He repeatedly fired the cannon in various directions, including across the river, and the local people made piles of the stones that the cannon shot, marking the edge of his lands. This boundary formed the Tuli Circle, which is part of Zimbabwe, even though some of it is on the Botswana side of the river. And this is how we were able to walk to Zimbabwe. After some of the tales West had been telling us recently, we weren�t completely sure whether or not to believe the whole account of how the Tuli Circle was formed � but it did make a good story. But the thing that was disturbing was that the animals don�t recognize the border, and hunting is allowed in the Zimbabwe portion. West told us a little about the politics of Zimbabwe; it has a history of dictators, violence and civil war. Where Botswana has a stable government and economy, Zimbabwe does not, and little is done there regarding conservation of the animals. We walked on, into a glorious sunset. The rough jeep track, bordered in grasses of pale gold, wound its way to the horizon. 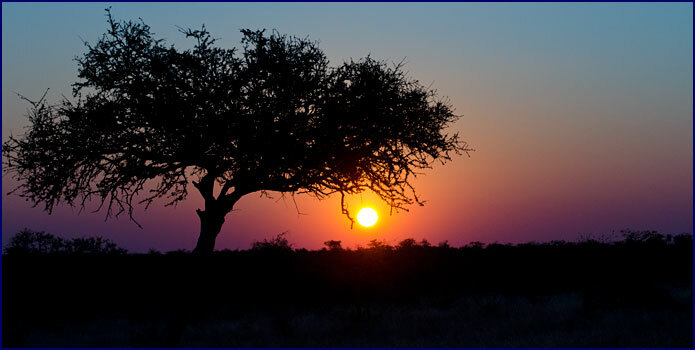 An acacia tree was silhouetted against the crimson sky. A kori bustard flew overhead on graceful wings. We found a patch of crystal geodes on the ground; we collected them like diamonds. Mooshi turned over a rock and found another scorpion. On the way back to camp, West showed us how to use the bullwhip. He could effortlessly crack it with a sound like a rifle shot. He let each of us take a turn trying; we were mostly pretty pathetic, though I did manage to whip myself in the face. How the staff must have been laughing at us! We had a lovely dinner by candlelight, with great conversation. West started telling us about his family life; he said he had five children, with five different mothers. I might have believed him if we hadn�t had the conversation about his fianc� while riding a few days earlier � when we called him on it he admitted he was pulling our leg. And oh, yes, male zebras are black with white, but females are white with black . . .